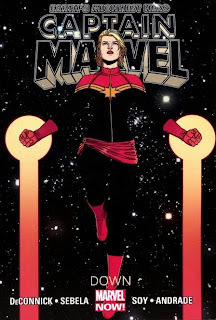 When the current Captain Marvel title launched, there were doubts that it could make it past six issues. By the end of the issues collected in Captain Marvel Vol. 2: Down, however, the book warranted a five-part crossover led off by a special one-shot. Much of Captain Marvel’s success can be owed to a strong and passionate fanbase called the “Carol Corps.” Mobilizing through Twitter and Tumblr and in constant contact with author Kelly Sue DeConnick and the various artists, the Corps has established itself as a bulwark against sexism in comics. I even got official Carol Corps dog tags after meeting DeConnick at a signing in Tampa. Many new readers have flocked to Marvel Comics with Captain Marvel as a gateway, and while Down isn’t perfect, it’s easy to see the character’s appeal. The two-parter that kicks off the trade teams Carol Danvers with Monica Rambeau, a previous Captain Marvel and one of the stars of Nextwave. Her look and somewhat gruffer persona from that title remain intact despite its supposed non-canonicity. While they bicker over their respective choices of code name, it becomes clear that Carol and Monica have a close friendship. More history is added with the return of Frank Gianelli who, like the irascible Tracy Burke, is a returning character from the '70s Ms. Marvel title and Carol's old job at Woman magazine. Later on, private eye Dakota North, who had her own title in the '80s, appears as another of Carol’s friends. These characters fit into the overall theme of Down and the issues which come after it: Carol’s past is catching up with her in dangerous ways. To cement this concept, Carol and Monica are forced to fight a giant, regenerating robot built from the wrecks of crashed ships and Air Force planes. Carol even calls it a metaphor for her life: everything she holds dear coming down at her with a massive fist. Simultaneously, DeConnick and co-writer Christopher Sebela pull a neat trick on the reader by ascribing the robot’s creation to an enemy of the Avengers, the fearsome Dr. Hogarth Hamontree. If you’re never heard of him … that’s because he was made up for this story. The whole scenario sounds like a classic issue of The Avengers, though, and it adds to the backstory while simultaneously making the reader (and the Marvel Universe Appendix website) question what they know. Upon her return to New York, Carol gets a new job thanks to Tony Stark, and the artist changes from Dexter Soy to Filipe Andrade, to the book’s detriment. Soy was the weaker artist on In Pursuit Of Flight and while he does a great job drawing the giant robot enemy, his female figures are still sort of off. Andrade is a good artist, but is not the right artist for Captain Marvel. His spindly figures and odd faces just look wrong; Tony Stark’s mouth in issue #9 looks like it’s bigger than his face, and everyone has weird, pointy noses too low on their heads. He’s definitely an artist that needs an inker to get rid of some of the sketchiness. This isn’t helped by Comixology’s guided reading function, which zooms in on every panel as if to point out how odd the people look. I tried reading it with guided reading turned off, and that helped only slightly. The strength of the writing is what saves Captain Marvel from the weakening art. Carol coming home introduces or reintroduces us to her supporting characters, demonstrating her strong connections to everyone from Spider-Woman to the little girl who lives in her apartment building. When her life begins to fall apart, people are there to both help her and be affected by her decisions. It’s one of the best counter-arguments to the stupid statement that superheroes shouldn’t be allowed to have happiness in their lives. Really, it’s the opposite: if they’re happy, then they have more to lose. This is when Carol receives the diagnosis about a series of headaches and power issues she’s been having: she has a lesion on her brain created by her powers which expands every time she flies. Considering how important flight is to her life -- as seen in the aptly-titled Captain Marvel Vol. 1: In Pursuit of Flight -- this is devastating to her. At the same time, the writers inject some humor, as when Captain America gives her his flying motorcycle so that she can fight Deathbird, a returning Shi’ar enemy. Much like Dr. Hogarth Hamontree, Deathbird is a continuity issue, since she should be dead after events in the X-Men titles. Her true nature is tied into Carol’s illness; like many brain tumor victims, Carol is having hallucinations … and thanks to her powers, they’re far more real and dangerous. Carol’s tumor plotline has had a stronger impact on me over the last few weeks. I recently learned that a good friend of mine has a similar tumor; she actually happens to look like Carol as well. Watching Carol deal with her medical issues has been inspiring, and it’s why I’ve kept following Captain Marvel and why I whole-heartedly recommend Captain Marvel Vol. 2: Down despite my qualms with the art. Who should take over the art duties on Captain Marvel? Well, now that Journey Into Mystery was boneheadedly cancelled three months before the next Thor film, Valerio Schiti is open to take on the task. He's proven that he can draw gorgeous yet badass women with the right amount of sexuality without veering into cheesecake. Next week, I’ll take another look at Carol in the pages of Avengers Assemble as I review some of my favorite Marvel NOW! titles begins. And tomorrow at Collected Editions, more "Captain Marvel," of sorts, with a review of DC's new Shazam! hardcover. Upon first seeing Andrade's art I was immediately turned off to it. However, I followed the book through to the second trade, and was greatly surprised to find that I actually enjoyed his style. It is difficult to get past the faces, but I found myself missing the sheer kinetic energy in the linework when I read other books.